The Ruckers 1628 is a superbly-sampled recreation of one of the greatest and most valuable harpsichords of all time! Flemish instrument-building family Ruckers need little in the way of introduction to those in the know; suffice to say, their highly-valued (and valuable) historic harpsichords are akin to Stradivarius violins built by the Stradivari family. You could even say that the harpsichord was the 'synthesizer' of its time, without which influential early musical stylings such as baroque and renaissance would never have emerged. 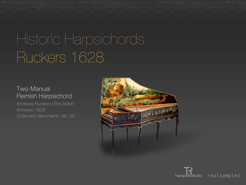 Historic Harpsichords – Ruckers 1628 has been tested and tuned with hardened harpsichord instrumentalists and features full recreation of all stops and combinations. Creative users can play both manuals individually using separate MIDI channels with faithful recreation of manual coupling using key velocity for controlling onset delays. It includes historic tuning systems such as Werckmeister, Vallotti, Krinberger, Meantone, and more. Main a4 pitch is tuneable by +/- one semitone specifically for historically-correct performances. That said, performances need not necessarily be restricted to faithful recreations of those notable early musical stylings, but are applicable to current genres, too. Technologically speaking, Historic Harpsichords – Ruckers 1628 is truly a state-of-the-art app, supporting all iOS standards such as AudioBus, Core MIDI, Virtual MIDI, and InterApp-Audio. Indeed, it can be played using Apple's InterApp-Audio or from other iOS apps via virtual Core MIDI. When using it as a sound module for MIDI controller keyboards it is fully playable using Core MIDI-compliant interfaces or Apple's Camera Connection Kit and class-compliant USB MIDI devices. Of course, superb sample content is also a given with Historic Harpsichords – Ruckers 1628 making mind-blowing use of 800MB of sampled data, including key release sounds, while high-quality floating point audio processing is used throughout. 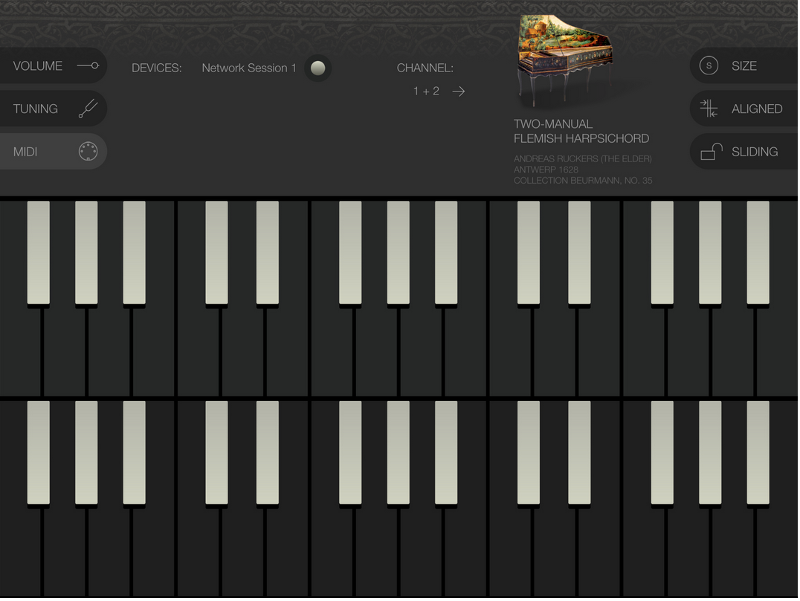 Today any appropriate iOS device owner can dive right in to the rich sampled sound of the original Ruckers 1628 harpsichord and start exploring the app's capabilities using the onscreen keyboards. Universal app for iOS supporting iPad Air, iPad Air 2, iPad mini 2, iPad mini 3, iPhone 5S, iPhone 6, iPhone 6plus or later. Der Preis beträgt dezeit noch 8,99 €. Nach dem 02.12.2014 kostet die Software dann 29,99 €.